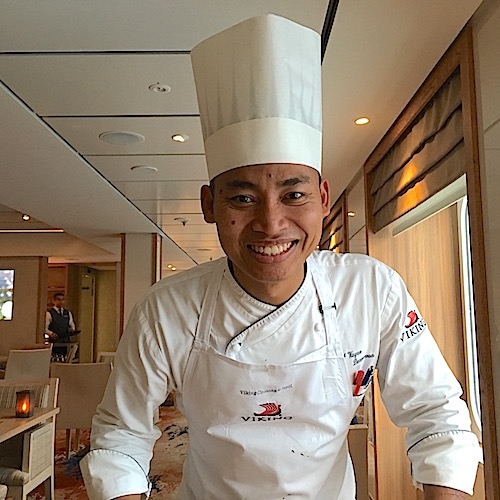 ABOARD THE VIKING SKY – Eating at The Chef’s Table is like taking a culinary trip around the world. The five-course menu is set. That means you don’t order, you just eat what is brought to the table. Although I had never heard of some of the dishes described on the set menu, I must say I enjoyed them all. Some a little more than others. It was quite a tasty education. One of the Viking Sky’s specialty restaurants, The Chef’s Table requires a reservation but no extra charge. Passengers are guaranteed to dine there at least once on a cruise. 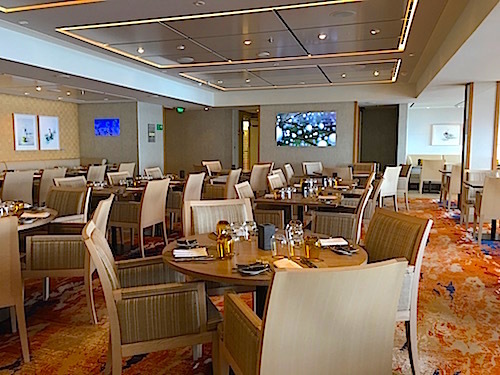 The menu changes every two or three days and passengers can check on their stateroom TVs to see if there are open reservations. All of them were good. Xiang was my least favorite because it was too spicy for my taste. Xiang was inspired by China’s Cantonese and Hualyang cuisine and other diners seemed to like it. Because the menus for each theme were too long to describe them all, I’m just going to share my favorite – “Venice Carnival.” The servings were small enough to taste but not so large that I left food on my plate. I don’t like to waste and these sizes were just right. The menu was patterned after the Venice Carnival that proclaims itself “the world’s most delicious festival.” Taking place during the dark days of winter, Carnival is a visual and gastronomical delight. The menu notes that Venetian cuisine developed because of the city’s unusual location where sea and canals intertwine. Fish and shellfish are abundant in the lagoon and nearby Adriatic. Then the islands of the estuary provide fruits and vegetables. The mainland contributes a variety of meats. Added to that are a panoply of spaces that have come into this port from distant Oriental lands for centuries. Each of the five courses – except for the granita – was paired with a wine. Remember that Viking Sky has complimentary wine, beer and soft drinks with lunch and dinner. 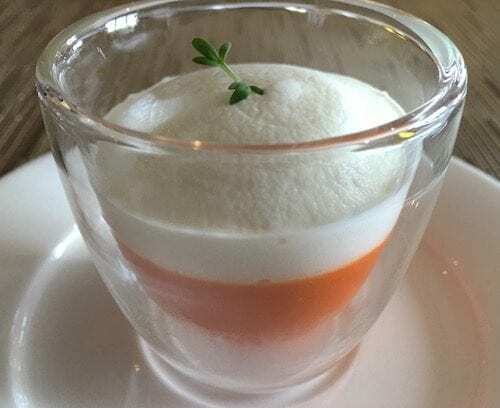 Roasted pepper and tomato jelly with goat cheese latte foam. Sacchetto Pinot Grigio wine. Beef carpaccio with fig and mustard vinaigrette. 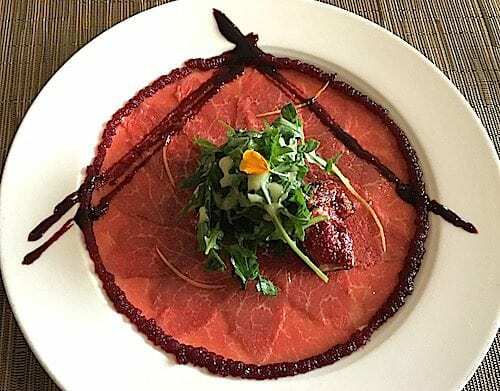 Carpaccio was created in 1950 at Venice’s famed Harry’s Bar and so named by the owner because the vivid red colors of the dish reminded him of the colorful paintings by Venetian master painter, Carpaccio. Sacchetto Merlot wine. As a side note, the story of Harry’s Bar began in 1931 when a rich young Bostonian named Harry Pickering frequented the bar in Venice’s Hotel Europa where bartender Giuseppe Cipriani served him. When Pickering all of a sudden stopped coming, Cipriani saw him and asked what happened. Pickering explained that he was broke because his family found out about his drinking habits and cut him off. Feeling sorry for him, Cipriani loaned him 10,000 lire (about $5,000). Some two years later, Pickering returned to the hotel bar, ordered a drink and gave Cipriani 50,000 lire (About $25,000) in return to open his own bar. It was named Harry’s Bar. In 2001, the Italian Ministry for Cultural Affairs declared it a national landmark. Bellini with peach juice foam. A mix of prosecco and peach puree, the Bellini cocktail was invented at Harry’s Bar and named for 15th-century Venetian artist Giovanni Bellini. 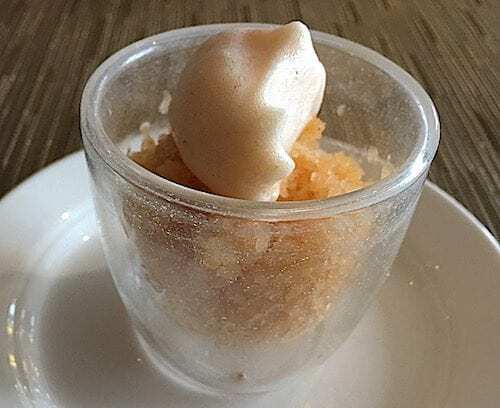 A granita is a semi-frozen palate cleansing made from sugar, water and various flavorings. 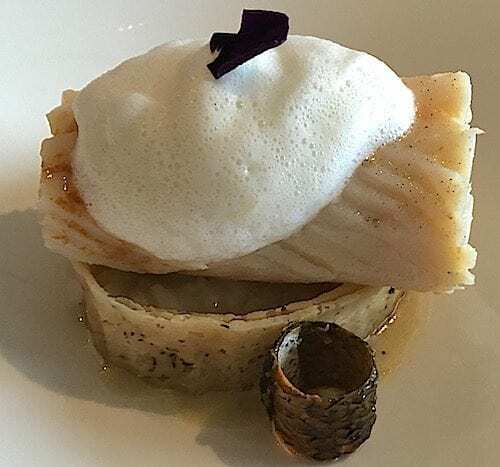 Cod fillet with Jerusalem artichoke, risotto and latte di tartufo. Sacchetto Pinot Grigio wine. 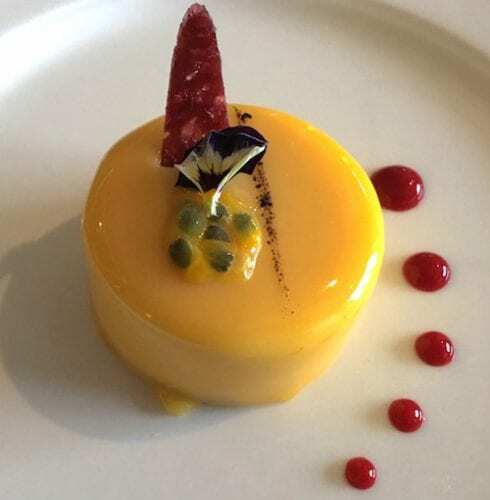 Mascarpone passion with mascarpone mousse and passion fruit. Inspired by Italy’s famous tiramisu, the sweet highlights two specialties of northern Italy – passion fruit and mascarpone. Vin Santo Cristina della Valdichiano wine.